This essay contains spoilers from the Netflix original film, Tallulah. Nothing excites me quite like the promise of a good film that takes on the complexities of motherhood, and the trailers for Netflix’s original film Tallulah promised all this and more. 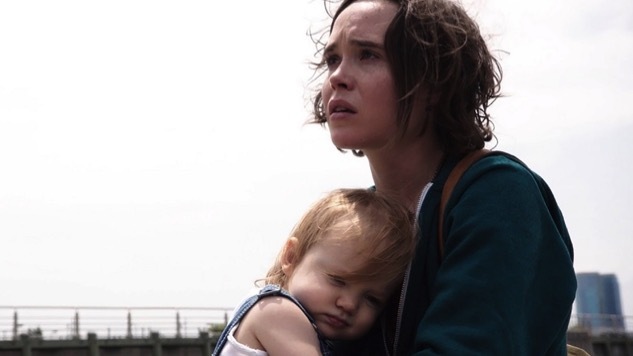 Ellen Page and Allison Janney co-star as two strangers, suffering from separate, devastating familial blows, who end up in a strange relationship—and taking care of a baby together, no less. Orange is the New Black writer Sian Heder wrote and directed the movie (her debut feature), and I had high hopes—and was especially excited to see the great Uzo Aduba in a whole new light. But aspects of the film began to fall apart from the very beginning, as it relied on an outrageous plot move that would have been far more believable with some more effort in the development of Page’s titular Tallulah. Now, I’m not opposed to the notion of a stolen baby as a great plot device. It’s worked for plenty of good films, from Raising Arizona to Baby’s Day Out. But it’s so important that, perhaps above all else, we first believe that the protagonists would steal an actual baby, and Tallulah never gives us enough reason to believe this about the main character. Tallulah is presented as an odd, quirky but fairly independent young person. The most important thing about her, the opening scenes seem to suggest, is her resistance to stability and sameness. It’s an interesting premise—a young woman seemingly content with her vagabond lifestyle, while her boyfriend (Evan Jonigkeit as Nico) is growing tired of their adventures as traveling, homeless folks, living out of a van (he’s tired, partly because his parents are well-to-do New Yorkers and he has a lovely home to return to). When he suggests they go back to New York and try to have normal lives, complete with jobs, an apartment and maybe even one of those kid thingys, Tallulah is completely disinterested. She suggests they find a way to get to India, where she’s convinced they’ll be happily poor. After being deserted by Nico, it’s clear that Tallulah wants to be free—but doesn’t necessarily want to be alone. It makes sense that she heads to the home of his mother (Janney’s Margo), looking for help and money. But when she steals a baby a few scenes later, then shows up at Margo’s house insisting that the baby is Nico’s, it’s a little… unbelievable. The plot relies on us believing that she’s irresponsible and damaged enough to steal a baby, but also compassionate enough to kind of, sort of want to take that baby for herself. Tammy Blanchard plays Carolyn, the “bad mom” who leaves Tallulah, a complete stranger who she assumes works for the hotel, in charge of baby Madison. Tallulah’s act is supposed to play like a very questionable salvation for Madison. Her biological mother is clearly unfit, but we don’t even know enough about Tallulah to understand why she runs out of a hotel room with a baby. It’s not unbelievable that a movie character would do this—it’s just unbelievable that her character would do this. Tallulah is at least interesting in the opening scenes, because she doesn’t want to be tied down; now all of a sudden she’s got baby fever? And if not that, she cares so much about this strange baby that she’s moved to rescue/kidnap it? In spite of some great performances, this disbelief hangs over the rest of the movie, no matter how hard one might try to suspend it. And it’s reinforced by other characters, like Carolyn. Carolyn is a woman who we meet when she literally hands her child over to Tallulah, a complete stranger. We don’t see her struggling with motherhood beforehand, and she is presented with no redeeming qualities whatsoever. She’s the drunken, drugged, Real Housewives of Beverly Hills-looking trainwreck to end all trainwrecks. Similar to Tallulah, it’s her initial presentation that destroys all film’s attempts at nuance later. Over and over she repeats that she doesn’t want the child, that having it was a mistake. As a mother who’s had similar thoughts at 3AM whilst breastfeeding, or at 2PM, whilst trying to complete an essay that a 2-year-old couldn’t care less about, such thoughts do not shock me. But Carolyn is not presented as a decent person who had no idea what having a kid meant—she’s only presented as a disgustingly privileged woman who’s furious at being inconvenienced by the presence of this being who cost her her youth and beauty. When Carolyn realizes Madison has been taken, it’s not like we suddenly see her wrecked with guilt and fearful of Madison’s well-being. Instead, she wakes up from her drunken stupor and realizes that her husband, whom she’s there, in the first place, to cheat on, is going to now cut her off financially, and also probably yell at her for losing their daughter. Tallulah puts in so much work demonizing Carolyn, that it fails to convince us that she’s actually just another flawed human in the end, when she finally confronts Tallulah and begs to have her daughter back. Through it all, I was grateful—as I knew I would be—for Uzo Aduba’s presence. Her role is small, but as Detective Kinnie, she plays the blessed voice of reason who eventually tears into Carolyn for her neglectful abuse. At one point, Kinnie expressed the confusion that we’ve all been suffering through: privileged women like Carolyn who don’t want their babies usually just hire full-time nannies. What’s Carolyn’s excuse? She says early on that she didn’t want to bring her nanny, for fear that the nanny would tell her husband that she was in New York cheating, but it’s just not a satisfactory explanation. Carolyn is a mess, and it’s hard to believe she would have even willingly gotten on a plane with Madison, without hired help. Unless of course, she’s just the dumb, ditzy drunk we were basically told she was at the beginning of the film—but if she is, why should we care when she starts to show human, decent mom-like traits? The problem is, we don’t. On the other side of all this is Alison Janney’s Margo, a brilliantly designed (and performed) character. As a writer and reluctant divorcée of a lauded professor (played by the always welcome John Benjamin Hickey) who recently came out as gay (and is being praised for his “bravery,” while she struggles to come to terms with the abandonment), she works as the new voice of reason in Tallulah’s life. Margo also benefits from Tallulah’s (initially unwelcome) presence in a way that makes sense—she needs a young, carefree presence to remind her of that time long ago when she believed the world was hers. She’s both infuriated and inspired by Tallulah, and when she steps out and does some shocking things (shocking, given her character), it still makes perfect sense for the narrative. Her arc in the film feels believable and complete, where Tallulah’s fails at almost every point, and all because the initial theft never made sense. I suspect Heder was convinced that one reveal explained it all perfectly; Tallulah tells the story of being abandoned by her own mother, making it clear that she felt a personal connection to Madison. But even this reveal lacks the intended impact. I’d argue that there’s even something lazy about this point—Well she was abandoned, so of course she’d want to rescue/kidnap a child that is similarly unwanted. Again, it’s not that I can’t conceive of a well-intentioned kidnapping, it’s that Tallulah went from being a woman who didn’t want any normal responsibilities in her life, to suddenly being desperately maternal after spending the day with a baby (and we should all know by now that this just isn’t what happens after an entire day with a baby, or children of any age—see the Master of None pilot, which addresses this perfectly). And still, I have to say that Tallulah is definitely getting at something here, and it’s that something that made me watch the film, even though I suspected it might not pull it off. It’s that something that I’m wrestling with now—something that makes me want to watch the film again, despite my frustrations. For one, it’s to the film’s credit that they do not present Tallulah as the good mom to Carolyn’s bad mom. Poor baby Madison is “rescued” by a troubled, lying woman who lives in a van. And even Janney’s character does not fit the good mom trope. Margo lied to herself, it seems, to create the image of the family she wanted, and lost both husband and son in the end, as a result—though Tallulah doesn’t villianize her either. This is no small feat—presenting a movie about mothers and resisting the urge to hold up at least one woman as an archetype of Good and Maternal. Knowing that she’s capable of chipping away at one of the oldest and most damaging myths in the patriarchal book, I’m thrilled to see what Sian Heder comes up with next. TV shows like Orange is the New Black and Amazon’s Transparent have explored the good mom/bad mom myth, and attempted to complicate them for the small screen. But after reading our review of Bad Moms, I’m convinced that the film world is perhaps, trying to tread in some new and deep waters, in attempting to tackle these same problems. Even if Tallulah and other recent films don’t completely succeed in their interrogations of the maternal myths that continue to define us, it’s exciting that they’re making space for more stories that will. If the future is, indeed female (and I suspect that it is), more writers and directors are going to be inspired by these stories, which means moms and critics like me have plenty to look forward to in the way of complex, trope-breaking, patriarchy-destroying art. Shannon M. Houston is a Staff Writer and the TV Editor for Paste. This New York-based writer probably has more babies than you, but that’s okay; you can still be friends. She welcomes almost all follows on Twitter.